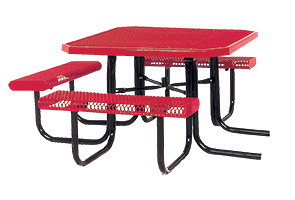 Create inclusive patio dining and outdoor seating areas with safe and sturdy steel picnic tables. Built ready for abundant use these 46" square top tables and seats are sealed with an ultra-resilient UV-stability polyethylene finish. The bench style seats are engineered with rolled edges for great comfort. The popular modern finishes make these steel diamond pattern octagon tables a top choice in providing reliable and durable seating. Constructed with durable 3/4" #9 expanded steel for an open, low maintenance diamond pattern design that is great for outdoor environments. The subtle, yet distinctive octagon table shape features attached bench seats supported by a 14-gauge 1-5/8" steel tube frame.